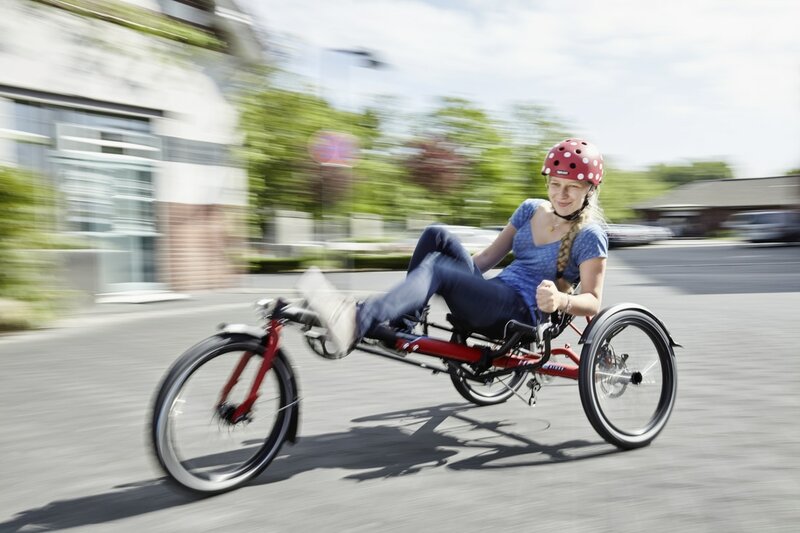 HASE Bikes has been designing and producing Bicycles, Recumbent Tricycles and Tandems for more than 20 years. Each bike is hand built within the company before packaging for tightly controlled quality assurance, and then forwarded to one of our dealers for final fitting to the customer. HASE bikes and trikes are by design easy to customize to a broad scope of riding styles and abilities. The types of bikes we build, whether for commuting, touring or leisure, are of the highest standard in materials and assembly. The team at HASE BIKES USA has more than 40 years experience in design, manufacturing, distribution and customer service. ​Call us at 802-382-0093 today and we will find a way for you to get a first hand experience in riding some of the best bikes ever made. 1989 Marec Hase – 17 years old – wins 1st Prize at the state youth science and technology competition “Jugend forscht” with the design of a tandem trike. 1990 2nd Prize at state competition “Jugend forscht” with a foldable recumbent cycle. 1992 Enters “Jugend forscht” with two recumbent cycles hitched side-by-side. 1994 Hase-Spezialräder founded in Bochum. In the company courtyard, Marec Hase and his first employee, Igor Pawiltchenko, build the first small production series of a full-suspension recumbent cycle and a semi-recumbent tandem. 1995 New products: the Lepus recumbent trike; special adaptations for cyclists with limited mobility. Cooperation begins with the company Efbe Prüftechnik, which offers testing services for leading bicycle manufacturers. 1998 Hase bikes are being sold throughout Europe. Hase-Spezialräder continues to grow, with 5 employees. 1999 First Hase cycles exported to the US. 2000 The company continues to grow, and the search for a new location intensifies. 2001 The Hase company moves to the historic coalmine facility in Waltrop. The company Efbe Prüftechnik moves to the same location. The first Tandem Fair is held in the magnificent hall, which was built at the turn of the century. 2002 The first Trets child trailers are sold, expanding the product range to fit the needs of families with children. 2003 In the summer of 2003, Hase sets a new world record with the help of numerous customers. Sixty-two Kettwiesels are hitched together to create the world’s longest trike tandem. Entered in the Guinness Book of Records. 2004 Sales for the unique Hase bikes continue to increase. The exclusive Titan/Race series is created. The company now has 16 employees and celebrates its 10th anniversary. On this occasion, the company releases a DVD with 9 different films documenting the cycling fervor caused by Hase bikes. 2005 First year of participation in Extraschicht – Night of Industrial Culture. 2006 Extraschicht attracts approx. 7,000 visitors to Waltrop. 2007 Hase Bikes receives regional Best Business Award (Vestische Unternehmerpreis). Hase bikes are now being sold in 21 countries – worldwide. Total employees: 30, 7 of which are trainees. 2008 Starting in May 2008: Construction begins on a new production hall on the grounds of the Zeche Waltrop.